AUD is losing power against its American counterpart due to Retail Sales release and Chinese CPI. 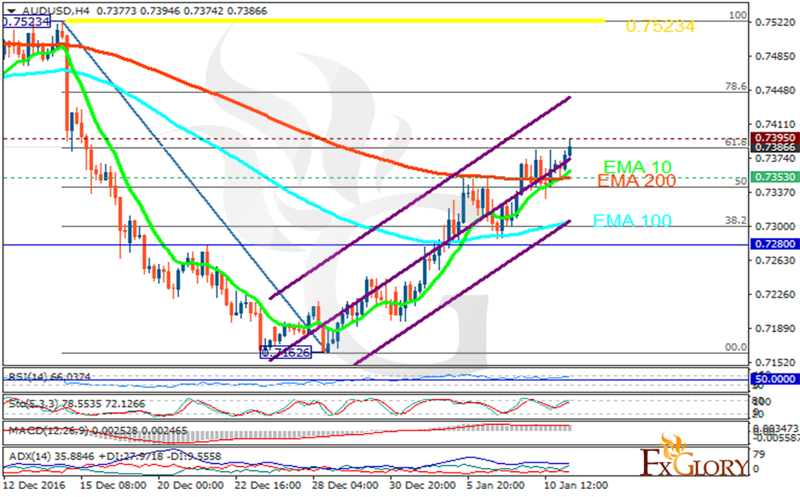 The support rests in 0.73530 with resistance at 0.73950 which both lines are above the weekly pivot point at 0.72800. The EMA of 10 is moving with bullish bias along the ascendant channel and it is located above the EMA of 100 and the EMA of 200. The RSI is moving on overbought area, the MACD indicator is in the positive territory and the Stochastic is in high ranges, showing downward momentum. The ADX is showing a buy signal. The price has reached the 61.8 level of Fibonacci retracement therefore it is time for pullbacks after several days of growth. Sellers can target 0.7300 for the pair potential decline.